ICC's 25-pack RJ-11 6P6C CAT3 rated modular connectors saves you time and money. It is ideal for all voice and business system applications. 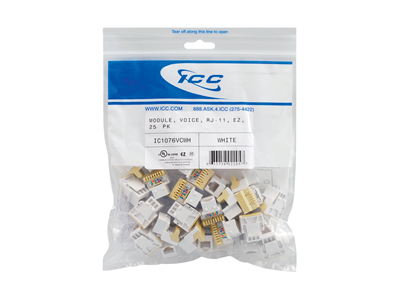 The 25-pack has a resealable strip at the top to prevent any mixing of colors or types of connectors or even misplacing any extra connectors you may have.